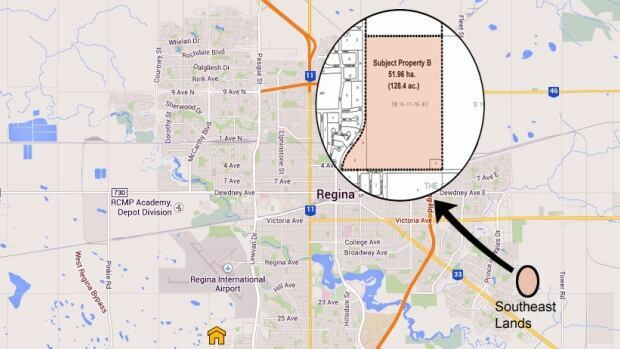 The City of Regina says it's keen for new housing development on vacant land it owns in the southeast corner of the city, saying it could generate a profit of $60 million. On Wednesday, a land development proposal will be discussed by the city's executive committee, which is city council in committee form. Officials are proposing that the city hire a land development company to do the work, rather than develop the land in-house or do a joint venture. Hiring a company on contract would mean the city would net around $60 million, rather than $30 million if it did the project as a 50-50 joint venture, a report to the committee says. In the short term, the city wants to build housing on a 128.4-acre (about 52-hectare) parcel of land in the southeast, just north of the Greens on Gardiner development. The plan is to build 978 units (houses, townhouses and multifamily units) that would be home to thousands of people. There's some risk to the city if housing demand collapses, but officials don't think that's going to happen. The city would finance the deal, which it says would cost $27.8 million. Assuming the committee gives the deal the green light, it will go to City Council March 23 for final approval. If all goes according to plan, grading on the land would begin later this year. Why southeast? The city HAS to upgrade Arcola first. It barely has the capacity for all the new neighbourhoods in the south east as it is. It needs to be 3 lanes both ways from downtown to the outskirts, not with the disappearing 3rd lane it has now. It also needs better intersection control or just fewer intersections to actually make it a free flowing artery instead of the painful stop and start that it it is now.